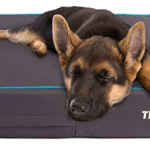 Are you looking for an orthopedic dog bed that doesn’t break the bank? How about one that has actual good reviews? Look no further! The BarksBar Snuggly Sleeper Orthopedic Dog Bed is the best of both worlds. It’s easy on the wallet yet high on the star ratings. The BarksBar Snuggly Sleeper does exactly what it says on the box. It allows for a snuggly sleep for your beloved pooch. I love a lot of aspects about this bed, but it’s shape and design really bark the loudest. Let’s take a look at all the details of this fantastic orthopedic dog bed. While some beds are just flat and lifeless, the BarksBar really steps up to the plate. The proof is in the pudding with this bed. Let’s take a look at all the details. 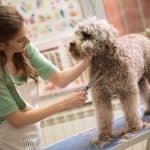 While the manufacturer always provides great information and interesting tidbits, I find the reviews from people and their pets to be the best decision maker for me. The BarksBar Snuggly Sleeper has excellent reviews. In fact, it has over 3,000 reviews and a 4.6-star rating on Amazon. That’s crazy! Let’s see what people liked so much about it. Padded Rim- This is a big one for a lot of buyers. The padded rim allows your dog to snuggle in, hence the name of the bed “Snuggly Sleeper”. It also aligns their head and neck properly if they have arthritis. 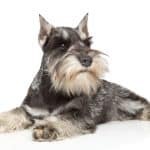 Many dogs as they age will develop arthritis and the neck can be a tender spot to deal with. 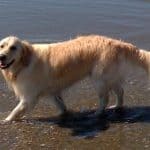 Having this starting at a young or even moderate age will allow for your dog to keep their spine aligned when they sleep. Plus, it’s just nice for them to be able to snuggle in. Orthopedic Mattress- This one has to be fairly obvious, but most buyers were happy with the orthopedic mattress. Not only is it about 4 inches thick, but it wears well and doesn’t have a high chemically smell like some mattresses come with. The orthopedic mattress was definitely one of the most highly talked about features of this bed. Machine Washable Cover- Anytime you pair up the words “Machine washable” and anything “pet” related, you have struck a gold mine. So many pet owners will agree that having a machine washable cover for a dog bed is a must. Nice Style – Blends in well with most home decor. Quality Zipper – Won’t break down after 1 wash. Holds it Shape – This is always a huge question with dog beds, “is it going to hold it’s shape?”. In short, Y-E-S! 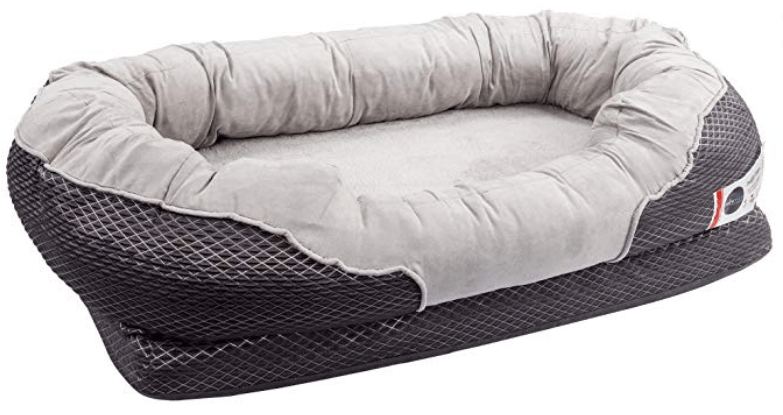 There are a lot of positive reviews stating this dog bed doesn’t cave or get lumpy. Actual Size – This seems to be a hot topic on this bed. If you don’t read the dimensions carefully, you may think you are getting a bigger bed than you are. The rim lessens the size so you need to make sure your dog can fit in a 36” bed and not a 40”. Cover Material – If you have a destructive dog, chances are they are not going to do well with this bed. It’s got a great design except for the cover material seems to rip or shred easily. I don’t think it’s anything to worry about with normal wear and tear, but anything else and it seems to fall apart. Needs 1 More Cover – A few customers reported needing to buy an extra cover to put around the mattress. This is again, due to the actual cover material not being waterproof or destruction proof. If you can put a pad or even a garbage bag around the mattress itself, you won’t need to worry about accidents. Removing Bolster is a Headache – The bolster can be tough to get in and out of the machine washable cover. I think that some reviewers just didn’t like the bolster period, but it’s a good point to know. Would This Orthopedic Dog Bed Suit Your Dog? For a plush bed is soft on your dogs joints and your pocketbook – the Barksbar is a solid choice. It’s comforting to see your dog nestle in and lie comfortably. Multiple users report that after year two, the bed is still in excellent condition without compressed cushioning and no obvious signs of wear and tear. That’s not always going be the case of course. Some dogs are hell-bent on destroying whatever kind of bed they are given. This model is probably not as durable for a dog that likes to dig into consistently, few beds can withstand that kind of assault. But for those dogs without the tendency to rip, tear, shred, or dig this may be the perfect option for them and you. The nice thick bottom of this bed provides the kind of support that aging bones will appreciate as cushioning is excellent. Moral of the story is, this is an excellent orthopedic dog bed, but make sure you don’t have a digger or destroyer on your hands. The BarksBar Snuggly Sleeper Orthopedic Dog Bed has it all. It’s comfortable for your dog and provides excellent alignment for their joints including their neck with the extra padded rim. The cost of the bed is very budget friendly for an orthopedic dog bed. I love the design and quality of materials along with the easy cleanup. You just can’t go wrong here! 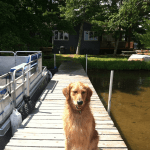 Having an ailing or older dog with joint issues can be tough. I know from experience! That’s why providing them with the best orthopedic dog bed in your budget is such a good feeling for both of you. It’s going to help them feel good for a longer period of time. It also will give you some peace knowing you have a comfortable spot that’s good for those old bones to lie.